ENSENADA, Baja California, Mexico — Providing a colorful trip down memory lane to help preview November’s 50th annual BFGoodrich Tires SCORE Baja 1000 is the cover story in Vol. 3, No. 10 of the acclaimed SCORE Journal. With three weeks remaining before the historic 50th anniversary race of the iconic SCORE Baja 1000, several spotlight features shine brightly in the current issue but none brighter than the first preview of the adventure that continues to etch its expanding legend into granite history of motorsports. There are also in-depth interviews with SCORE Baja 1000 legendary racer Rod Hall and another with prominent owner of PPI Motorsports Cal Wells III who fielded the Toyota race vehicles driven by Ivan ‘Ironman’ Stewart. Vol. 3, No. 10 of the SCORE Journal is once again filled with numerous interesting worth-reading stories, exciting videos and several news items. 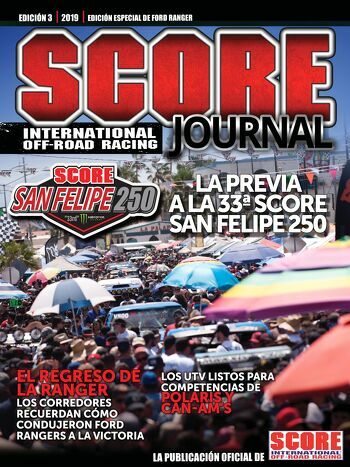 Another major feature in this massive edition is a thorough review of September’s Tijuana 21st SCORE Desert Challenge, the first race in SCORE’s storied history that actually started and finished in Tijuana. Thorough coverage includes the podium sweep in 4-wheel vehicles by RPM Racing and the second straight overall motorcycle win by the team led by rider of record Francisco Arredondo. This issue also takes a look back at SCORE’s participation in the Sand Sports Super Show and the Off-Road Expo, two very important trade/consumer shows for the offl-road market. Both events were at maximum capacity for exhibitors and attendees as SCORE continues its reach and impact at these events with major exhibits, press conference and a Dust 2 Glory ‘sneak peak’. 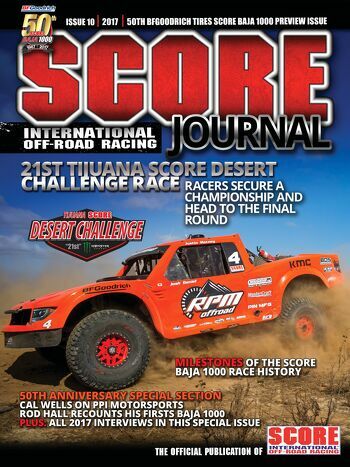 Also included in this issue are all the 2017 interviews from previous issues regarding the SCORE Baja 1000 as well as a quick look at Milestones in SCORE Baja 1000 race history. As always the issue again includes the Off-Road Marketplace displaying the latest products for racers and enthusiasts. The four-race 2017 SCORE World Desert Championship in Baja California, Mexico along with the SEMA SCORE Baja 1000 Experience/SCORE Baja 1000 Qualifying in Las Vegas will all air on El Rey Network in the United States. International distribution is by way of syndication. The season-ending 50th SCORE Baja 1000 will have a two-hour show produced while the other race shows are each one-hour telecasts. From award-winning documentary filmmaker Dana Brown, ‘Dust 2 Glory,’ scheduled to premiere nationwide on Dec. 6, chronicled each of the four races in the 2016 SCORE World Desert Championship. Brown’s original Dusty to Glory, released in 2005, became an iconic classic showcasing the legendary SCORE Baja 1000. D2G, which began shooting at the 2015 SCORE Baja 1000, continued up close and personal coverage capturing the robust racers in their amazing adventures in Mexico’s majestic Baja California peninsula through all four spectacular 2016 races. Executive Producer is BCII’s Bud Brutsman. Tickets for the special, one-night Dec. 6 nationwide premiere are scheduled to go on sale on Oct. 23. For information regarding tickets and theater locations, visit https://www.fathomevents.com/events/dust-2-glory. Previous ArticleSCORE BAJA 1000 Qualifying Highlights!